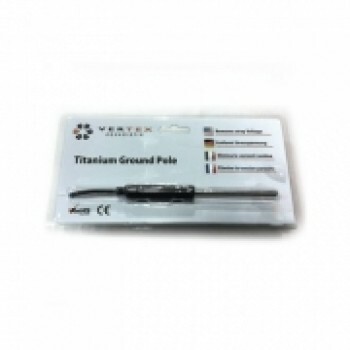 The vertex titanium probe eliminates voltage loss in aquariums generated by pumps, power heads, thermostats, lights and other electrical accessories that can be harmful not only to your pets but also for you. Ulike other existing probes on the market, vertex titanium probe copper wire has less resistance to dissipate electric charge when present. Removes stray voltage. 2.7mt. copper shielded wire, and mounting suction cup. Grounding probe gives you a positive electrical ground for your aquatic system. When properly installed, "stray voltage" which is generated by pumps, heater, lights, and other electrical devices used by aquariums will be carried away. Grounding probe protects you and removes unwanted stress from your aquarium's inhabitants. - A long lasting product that is non-corrosive in both fresh and saltwater.